Banders in Toronto, at Tommy Thompson Park along Lake Ontario (A on map), band over 200 of these birds beginning Oct. 16. At Prince Edward Point, Ontario (B on map) over 6000 are counted, and over 700 banded, beginning Oct. 19. Passage rates along the Chatham and Kent county lines in Ontario (C on map) are estimated around 300 birds per hour. Over 500 are banded at Long Point Bird Observatory, a peninsula in Lake Erie (D on map) beginning Oct 22. Over 1000 counted from the hawk tower at Holiday Beach, Ontario (E on map) on Oct. 30. The species: one of the most familiar and beloved birds in eastern North America, the Black-capped Chickadee (Poecile atricapillus). Chickadees are familiar because their range extends across most of Canada and the northern two-thirds of the U.S., where they are regulars at bird feeders. And while they are resident where they are found, they also stage periodic irruptions, a phenomena more often associated with winter finches such as crossbills, redpolls, and siskins. Irruptions — birds moving south from mostly boreal nesting areas — are typically due to a lack of food, such as a failed conifer cone crop, in usual wintering areas. That is also a factor in chickadee movements, especially following exceptionally good reproductive success resulting in “excess” numbers of young chickadees. The map indicates that high numbers of chickadees are being seen along the northern shorelines of the Great Lakes. As one might imagine, such small birds are loathe to cross big waters, and they congregate and move along the coasts. Still, there have been chickadee movements noted in the U.S., especially in update New York, eastern Pennsylvania, and Maine. Holiday Beach, near Amhertsburg, Ontario, is less than 30 miles as the chickadee flies from my field site. However, it’s south of me, and close to the mouth of the Detroit River where it empties into Lake Erie. Chickadees have no doubt traveled along the Erie or Detroit River shorelines, reluctant to cross, when they end up being counted at Holiday. Being west of those waters, and away from shores, I tend to see little of these invasions. In 2001, the last time there was a large chickadee irruption, I did set a high season banding total, but it was modest. It is very near the end of my banding season now, and I’m just starting to encounter these migrant chickadees. In the hand, they can be distinguished from residents by their bigger fat loads, and the simple fact that I haven’t already banded them earlier in the season, when I usually catch most of the local birds. I like chickadees as much as anybody. As an ornithologist, I am intrigued by their complex social structure, with well-defined flock membership and quite stable dominance hierarchies. As just a regular gal, I am charmed by chickadee acrobatics, energy, boldness, and all-round pizzazz. As a bird bander, I am overjoyed that chickadee invasions do not extend to my field site. 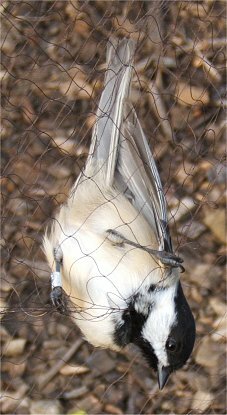 It’s hard for me to imagine a worse situation than nets full of chickadees; even dozens of flesh-clamping cardinals or diarrhea-spewing robins seems more appealing. All the bossy, determined fuss you see chickadees express in the field is magnified when they are in the hand. Observe how calmly this bird sits in my net. You can see we’d been through all this before — I had banded this bird two days previously. Note that it is hardly tangled, an easy bird to remove from the net. Note also the gleam in the bird’s eye, as it prepares to launch its assault. The moment I reach into the net, it will explode in an indignant whirl of commotion, a virtual avian tempest in a teapot. No other species squirms, wriggles, and hangs on to the net so tightly. Most obnoxious is the constant barrage of pecking, with an outstanding affinity for locating cuticles and other soft, sensitive places. I’ve been bitten by dozens of species of birds, and although not the most painful, chickadee abuse is clearly the most annoying. Chickadees remain miffed throughout the banding process. It’s really astounding how a 10-gram ball of feathers can make life so difficult. Inevitably when you open your hand to release them, they stick around for one final second — in order to offer one last good, hard peck. I welcome chickadees: to the U.S. from their Canadian boreal birthplaces, to my yard and my feeders, but please, not into my nets. A bander that I had corresponded with in Kalamazoo, MI reported 100 black capped chickadees. I think this number was reached over a period stretching from April to Oct. I have no idea if this is a high number for that area (nowhere near what's being reported along the shorelines though, wow). It was the highest number of all species that he reported… by a large margin. I've never really thought of chickadees as migrants, since we have good numbers of them here year round. Interesting links & numbers. You'll find them here in Alaska also from about Fairbanks on south. Chickadees are such regulars at our bird feeder that it never occured to me that they moved south. We certainly have lots here all winter and they are regulars along all the cross-country ski trails further north too. Having read your description of a netted chickadee, I think I will avoid that experience if I can. I never knew until I found your site that chickadees migrate! I live in St. Paul, MN, and they stay in our state year-long, too.I think they're one of the most delightful birds around, to see or hear, with their varied voices. As a child growing up in Duluth, I used to keep my bedroom window open other than during winters), prop my pillow on the windowsill, and lie there so I could listen to their songs. Haunting, yearning sounds, or just snap happy. his year is the first I've heard of a chickadee irruption–it's been fascinating to follow. About a month ago we had a surprising number in the yard for a little while–early stages I'm guessing. Usually we have a small group of about 5 or 6 coming to the feeders through the winter. So far this year, not the 20 or 30 of a month ago, but a solid 10 hanging out here. From your post, does this mean its possible that not only will we have redpolls here in numbers (an irregular phenomenon here) but we might have crossbills as well? Something unheard of in my 8 years in Thomasburg, and birds I've never seen before! There were 800-plus at Lighthouse Point, on Long Island Sound in New Haven, the other day. When I read the report, I thought at first it might be a typo. Interesting phenomenon. I wonder if the irruption will be enough to move some black-capped chickadees all the way down here. Probably not, but it would sure make for a tricky identification situation if it did. This has to be one of the coolest birding posts I've read. It's got everything – technical and regional context, a map, ecological significance, personal experiences, bird capture, and a little bird-on-human violence. Whew! Technical detail to correct: the currently accepted scientific name for Black-capped Chickadee is Poecile atricapillus (not atricapilla). The name got switched to the fminine ending for a while but was then changed back again (according to the complicated logic and traditions of zoolocial nomenclature). Thanks for pointing out my tired slippery finger error, Bob!